In a novel, there is a lot of information readers never see. Behind the scenes planning, plotting, and inventing (with lots of laughing and the occasional cackle. *ahem*). To help the characters come alive, we often spend hours discussing their upbringing, habits, history with each other, and anything else that pops into our heads. K.: What do we write about? J: How about the type of food our characters like? K: Daniel may have a British background but he’s not a fan of fish and chips. Or mushy peas. He can make them better. J: Hmm, yes. I think Daniel claims to have refined tastes, but his real comfort food is a curry take away that reminds him of his university days. Oh, Val just told me she doesn’t particularly like cooked asparagus. Or cauliflower. Maybe cooked broccoli, too. K: Why does she hate it? And can we use it in a scene? J: Something about them being boiled to death–the smell of the cooking water? But she’d probably inhale a box of cream puffs… or cheesecake. Yes, definitely New York style cheesecake. Philippe will do anything for those little lychee jelly candy things sold in Asian food markets. Or maybe just good brie. You think he’s a bubble tea kind of guy? Out here in K. of K.J. Garnet Land (Northern California), it’s the start of jasmine season, hooray! (The J. is currently whining burning up from the perfectly normal unseasonal warmth in the PacNW.) The sun is shining, the pigeons are cooing, the warblers are warbling, and the hummingbirds are periodically attempting to land on one’s head. It’s a favorite time of year, and after all our welcoming spring rains, this year promises a bumper crop of flowers and heavenly jasmine scents. There’s nothing better than writing on the patio. When we tell people we co-write, they’re often curious. This is usually expressed with faint skepticism, as if this couldn’t be, you know, fun. #1: No matter how similar your tastes, both bring something different to the table. J grew up in the ‘burbs but spent most of her adult life in the big city. She brings urban skepticism to character development. K grew up so far out in the country that she should take over the Grizzly Adams title. Neighbors have to be trusted because there are only two and no one wants a 10-mile hike to the grocery store for milk. If you don’t think this shaped some interesting arguments about character development, you’d be wrong. We talk about 50% reader input on everything, and this applies to writing as well. #2: Accept how your co-writer writes. Trust us ~ it’s not like you. One of our biggest breakthroughs came from recognizing how different we approach our writing. J is about the Big Picture (how all the little bits add up to one cohesive whole). K is about the Feelings (the emotions that drive the characters and grab the readers by the lapels). It took some time to see where the other was coming from when outlining the story. J’s still not comfortable with K going off on just any scene that pops into her head, and K still feels like a deer in the headlights when J asks what the scene conveys in relation to the overarching story, but it’s getting easier all the time. #3: No matter the differences, the goal is the same: write a fun-to-read story. Neither of us are perfect writers. We like the same books for different reasons; we like different books for contrasting reasons. But we both agree that we want to write entertaining stories that are fun, exciting, and page turners, so we agree to disagree and then get down to solving the problem whether it be technical issues like structure, character voice, or emotional depth, because no problem is unfixable. What happens when you write a review? As of March 2016, there are almost $4.4 million e-books on Amazon. 120,000 e-books debuted in the last 30 days. There is so much writerly advice out there on what writers “should do” that we jokingly started riffing on advice versus reality. Here we go…. 1. Find a comfy spot to write. It helps the words flow. Our second book is back from the copy editor, who has done the fantabulous job of catching all our typos, bad punctuation, and odd phrases. We recommend copy editors for every writer because author-blindness is a real thing (when you’ve been staring at a line for so long that the word “the” looks incorrect or you’ve reworked a line so many times that it now reads like a Gordian knot). Every writer has a funny verbal tick or repetitive ear worm. We’re not immune to this problem. We also discussed the usage and implied meaning of words and then realized that what each one understood was not exactly in line with the other’s understanding. So, we needed clarification. Forget the first-class air travel, the endless meeting with fans and readers, and the best-seller lists. That only happens with 3 writers and in the movies. As we prepare for the launch of our second book, Oracle in Trouble, we thought you might like to see what really happens. Software Challenges: Every once in awhile, our writing program (Scrivener) doesn’t always cross-pollinate well between our Mac and PC. This can sometimes lead to a few interesting turf wars. We do eventually figure out the technical challenges and amend them, but we’re still at the mercy of computer programs. It’s better than playing tennis with a Word document. Honest. Battle of the words: For the most part, writing together is pretty easy. However, we don’t always see eye-to-eye, especially when arguing discussing no arguing was right animatedly discussing word choices, sentence structure, and plot outlines. As other writers will agree, there’s no drama involved. None. Creativity x 2: Somehow we manage to write enough, spurred on by each other to get the work done, with only a few breaks in between. Having a cheerleader lobbing a handful of good ideas over the fence keeps us on our toes. Any day with words is a good day. Some days are better than others. The best days are when we’re both on the same track and the words are flowing. Finding a support system can be the difference between Dreaming It and Doing It. We should point out that Rockridge is actually a lovely place. It’s a subdivision in the Oakland Hills a bit northeast of Oakland city center with a lovely view of San Francisco. As far as we know, there aren’t any terribly haunted houses in Rockridge, and if there are, we are not basing our Becker House on any of them. We just liked a certain type of house that had certain types of features which might be attractive to a ghost. 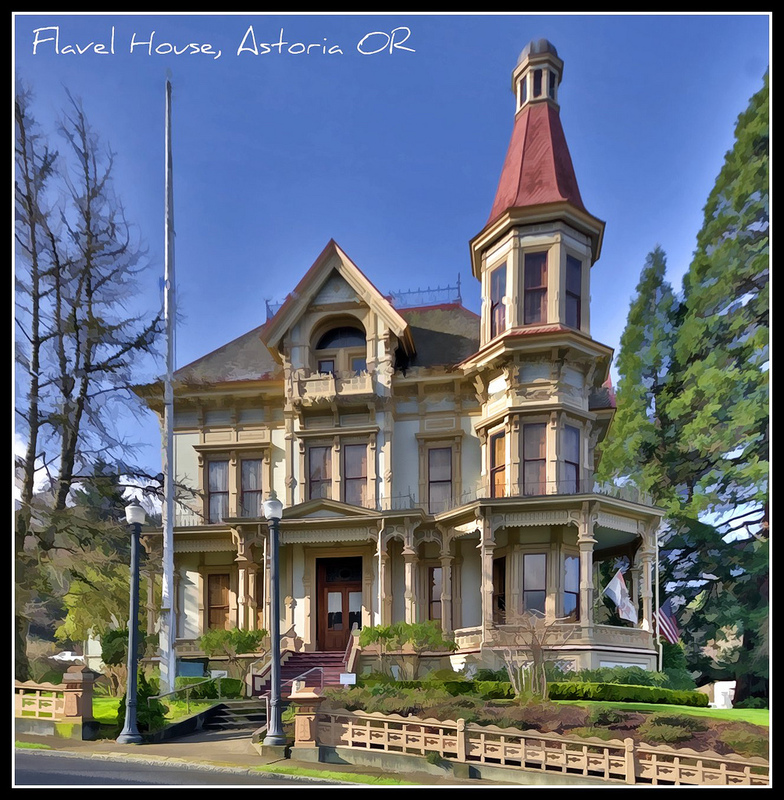 The Queen Anne architecture of the Flavel House in Astoria, Oregon, certainly appealed to both of us. This house is not actually in Rockridge. And it doesn’t necessarily have to be. Because we’re setting our world just left of reality, it’s not accurate. You couldn’t draw a map and follow it anywhere. San Francisco and the Golden Gate bridge fell when the psychic war set off the big earthquake and the Pacific made a new coast. The world we imagined doesn’t actually show up in book one, Oracle in Doubt, but the entire planet has been shifted. That’s half the fun of writing–we can tweak our world just so and tell a fun adventure in a familiar but not-quite-real place. What happens when two writers co-write a book? Well, if it’s a former New Yorker and a Bay Area transplant with French-Canadian roots, there are plenty of wild gestures (and some crap-tastically poor acting) as we attempt to block our scenes. One of these days, one of us is going to lose an eye. It really helps but we’ve tried to keep it down to a dull roar. In the meantime, we’re ready for our close-up, Mr. DeMille….